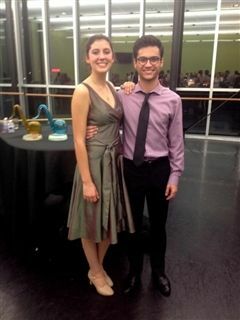 Congratulations to junior Catherine Ames and senior Ben DeSoto Mayor on their impressive performances last weekend at the 2015 Southwest Region Ben Vereen Awards. Both Catherine and Ben advanced to the regional finals (top three males; top three females), with Catherine winning "Best Actress" and a trip to next month's National High School Musical Theatre Awards (NHSMTA) in New York City! In New York, Catherine will have a shot at winning a coveted Jimmy™ Award, a $10,000 prize, merit scholarships, professional advancement, and more. Break a leg, Catherine!